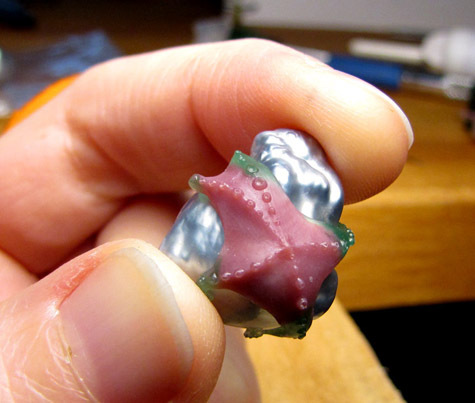 Here’s a shot of the backside of the earrings before my waxes were cast. Without the pearls my little tentacles seem so needy! 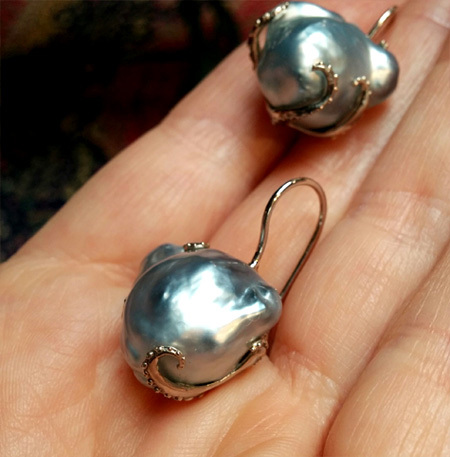 I made these for a jeweler friend of mine and didn’t do the final pearl mounting (which required a fancy welding machine so as not to fry the pearl in the process), so I didn’t have the final finished pair in my studio for light-controlled photos. I took these with my phone in the shop under lots of reflecty lights.. The earrings turned out quite awesome even if my photos are a little funky.. 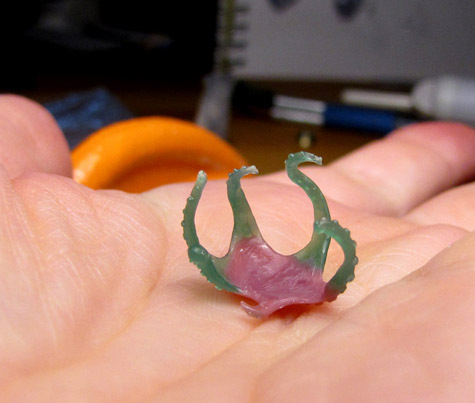 I have no idea how these pearls happened: they are lightweight (hollow I assume?) but extremely large. I’ve seen similarly large pearls, but they are always nucleated. 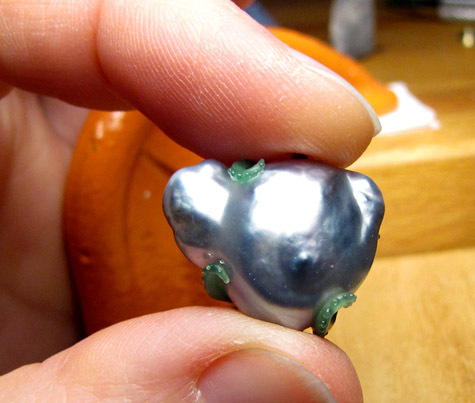 I’ve seen similar lightweight keshi type pearls, but they are always smaller. 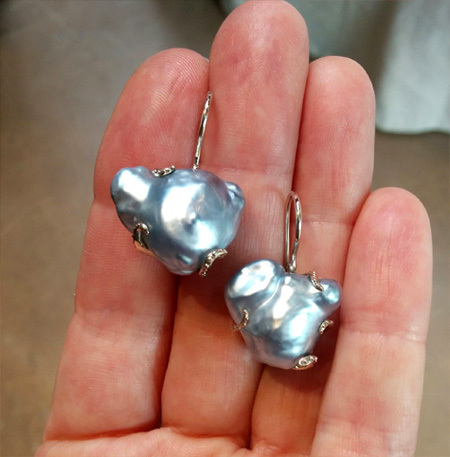 A few years ago very large hollow pearls were a thing, marketed as “souffle pearls,” but I haven’t seen them for some years now, and I don’t remember any being Tahitians. 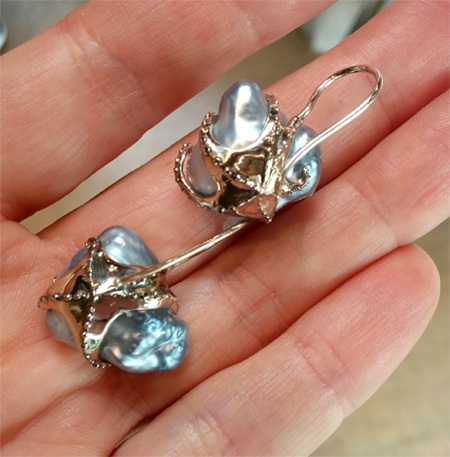 This entry was posted on Friday, March 2nd, 2018 at 9:32 am	and is filed under Earrings, New work. You can follow any responses to this entry through the RSS 2.0 feed. You can leave a response, or trackback from your own site. Souffle Tahitians debuted a few months ago, from what I understand, though like freshwater souffles their availability is very limited.